Nate Laszewski posted game-highs of 12 points and nine rebounds in his first career game to lead Notre Dame to an 84-67 win over UIC to open the 2018-19 season. 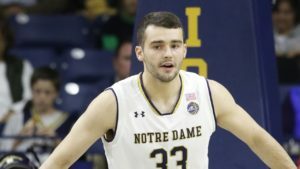 Fellow freshmen Robby Carmody (10 points) and Dane Goodwin (10 points) also tallied double figures, as did John Mooney (pictured, credit: irishsportsdaily.com) and D.J. Harvey, who each netted 10 points to go with eight and six rebounds, respectively. The Fighting Irish won the battle at the foul line, connecting on 36-of-38 free throws while UIC was 13-of-20. The Flames were paced by the 17-point effort of Marcus Ottey. Tarkus Ferguson had 12 points and six rebounds, and Jordan Blunt and Godwin Boahen had 10 points apiece. The Gotham Classic continues on Friday when UIC travels to Radford to take on the Highlanders.